Three of every four marketers are using programmatic today. Targeting and performance are key drivers of adoption today, competitive dynamics less so. Measurement of results, data integration, site quality, brand safety, and resource limits top issues inhibiting programmatic today. How programmatic is managed today varies immensely. Programmatic is forcing organizations to reallocate their resources. Tactical issues such as transparency, fraud, availability of quality inventory, cost, and ROI are keeping marketers up at night. Programmatic spend will continue to grow for the foreseeable future. 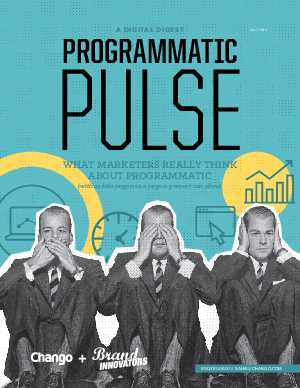 Programmatic is more than display.